Circadian rhythms play an important role in our biology by adjusting it in a way that takes advantage of patterns in food availability. They exert a substantial influence over our physiology by controlling many aspects of our behavior including state of arousal, motivation, appetite, and digestion. Circadian disruption is associated with a number of GI disorders including inflammatory bowel disease, irritable bowel syndrome, small intestinal bacterial overgrowth, ulcers, and gut dysbiosis. This association may or may not be causal, but the evidence indicates that circadian disruption, at the very least, exacerbates symptoms of these conditions. In some cases, there is direct evidence that addressing factors that cause circadian misalignment can dramatically improve gut disorders. The evidence indicates that addressing circadian misalignment by scheduling exposure to factors that manipulate it is a valuable tool in the healing process for GI disorders. Gastrointestinal disorders affect 60-70 million Americans(1), with many having no known cure. As a result, the standard of care for many of these conditions is directed at managing symptoms with pharmaceutical drugs or restrictive diets. Diet can be very effective for symptom management, particularly when symptoms involve painful gas and bloating or other food intolerances. But why would you suddenly develop a sensitivity or intolerance to something you’ve eaten for much of your life without issue? This is the question that plagues many people with a gut disorder. This factor may contribute to developing these conditions as well as making symptoms worse. This factor is circadian rhythms. Circadian rhythms are endogenous fluctuations in biological processes that follow a 24 hour pattern that drive behavior. Changes in cortisol and melatonin that regulate the sleep/wake cycle are great examples of circadian rhythms. Circadian rhythms exert a significant amount of control over a wide range of human physiology, particularly with regard to energy metabolism, digestion, detoxification, immune function, arousal, physical activity, and the sleep/wake cycle. 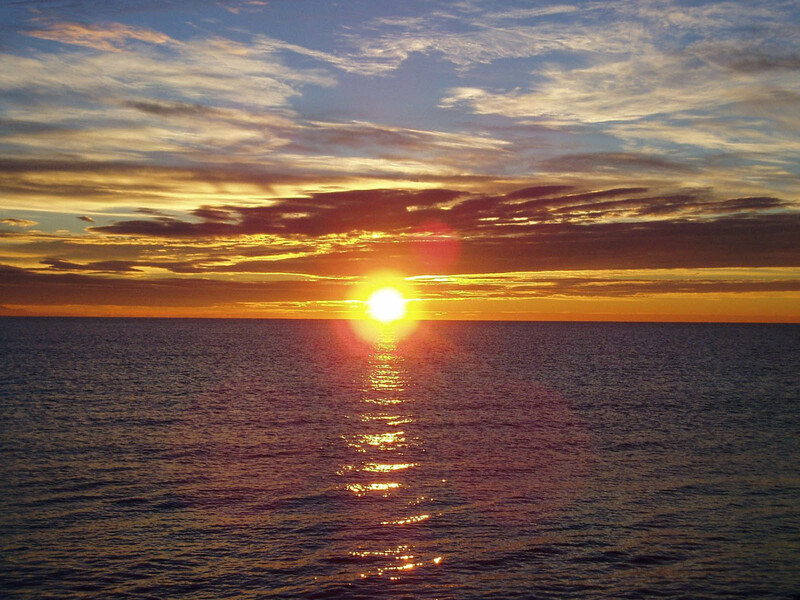 Circadian rhythms provide a strong advantage to an organism by providing a way to anticipate and respond to environmental factors that are crucial to survival. This includes the day/night cycle, acquiring food, avoiding predators, and regulating the immune system in response to foreign invaders and damage accumulated during the wake/active phase. Circadian rhythms are driven by clock genes that help regulate genetic expression in target tissues. Clock genes can be found in the master clock in the suprachiasmatic nucleus(SCN) in the brain, but also in peripheral organs including the gut, liver, esophagus, lungs, pancreas, spleen, thymus, skin, muscle, adipose tissue, and adrenal glands. These clock genes work by sensing environmental cues called zeitgebers and turning on, or entraining, target tissues to respond to the environment. These zeitgebers include light exposure, the feeding/fasting cycle, body temperature, physical activity, and social interaction. When a zeitgeber turns on the clock in a tissue, the proteins CLOCK and BMAL1 travel to the nucleus and bind together. This increases the expression of the proteins Period(PER) 1, 2 & 3 as well as cryptochrome(CRY) 1 & 2. As these proteins accumulate, they block the effects of CLOCK and BMAL1. Over time they are degraded and the cycle begins anew(2). Even in the absence of zeitgebers, these cellular functions are regulated in a way that causes a rhythm in the SCN. Therefore, there is an endogenous circadian rhythm that keeps repeating even without external cues. This endogenous rhythm varies between individuals, but is 24 hours and 15 minutes on average. Since this rhythm is not exactly 24 hours, a lack of exposure to zeitgebers can de-synchronize your circadian rhythms from the day/night cycle over time. Initially, circadian research pointed to a single master clock located in the SCN that’s responsive to light. It was believed that this was the only clock and, therefore, light exposure was the only zeitgeber. However, it was later determined that there are other clocks, called peripheral clocks, that are autonomous from the master clock, though partially controlled by it. These clocks are controlled by other inputs, primarily the feeding/fasting cycle(3). We don’t know exactly how the master clock exerts its control over the peripheral clocks, but the thought is that one or more of the rhythms regulated by the master clock, most likely melatonin or cortisol, provides a signal to help sync the clocks together. Despite being influenced by the master clock, peripheral clocks can function without the master clock. It’s easy to see why having multiple clocks entrained by multiple zeitgebers that follow some inherit rhythm in the absence of zeitgebers provides an advantage. If humans were only responsive to light, going to sleep in a dark cave or room would lead to eternal sleep. Furthermore, how can you anticipate food availability if there is no feeding/fasting cycle? The clocks in various tissues are dependent on synchronization with the other clocks for proper communication and to coordinate biological processes involved in metabolism, digestion, and arousal/physical activity. This is typically done through neural or hormonal mechanisms, a great example being the hormone ghrelin. After a long period of fasting, ghrelin is produced in the stomach and travels to the hypothalamus where it induces hunger. But that’s not all, ghrelin also stimulates the arousal and reward centers in the brain, two factors that increase our drive to seek out food. Without ghrelin, you don’t feel hungry and you don’t seek out food, a stimulus/response necessary for survival. Another interesting aspect of ghrelin is that it seems to promote neuorgenesis in the hippocampus, an area of the brain important for laying down new memories(4). This shows how syncing clocks provides a survival advantage. If you’re starving and pumping out large amounts of ghrelin, there’s a distinct advantage to this process if it makes it easier to lay down new memories of where you find food. It’s easy to see why all this is important. Zeitgebers are effectively communicating the state of the environment to you, provoking a response that ultimately promotes survival. Of course, if the ultimate goal of circadian rhythms is to provide an anticipatory advantage to an organism, it would make no sense for it to be only responsive to one environmental cue. Without feedback there’s no basis for determining success. In a general sense, circadian rhythms set up a dichotomy in the day where we are awake, active, and feeding during a portion of the day and resting, sleeping, and fasting during the remainder. This dichotomy sets up a scenario where during the wake/active phase we are using tissues and the cells that comprise them and during the sleep/resting phase we are repairing and restoring them. A great example of this dichotomy can be seen in the gut, both at a macro and micro level. At the macro level, periods of fasting allow a build up of digestive and brush border enzymes that are stored for the feeding cycle. In anticipation of feeding, these enzymes are released to help digest and absorb your food. Without a true feeding/fasting cycle, optimal digestion can’t be achieved. On the cellular side of things, circadian rhythms help dictate cellular repair and turnover. During the feeding phase, the gut is exposed to a number of insults including pathogens, environmental toxins, and poisonous food components that can damage cells. During the fasting period, the processes of autophagy and mitophagy replace damaged cellular components and apoptosis removes cells that are beyond repair. Mass cell turnover during feeding would be devastating. Keeping in mind that the gut is a single tissue, it’s important to understand that it works in concert with other tissues and their peripheral clocks. The microbiome contains a microbial clock where different bacteria interact with the intestinal wall and bloom at different times of the day. Metabolites these microbes generate interact with the gut and liver clock to process toxins and pharmaceutical drugs and regulate genetic expression. Basically, the microbial clock helps regulate our circadian clock via the gut and liver(5). The influence of the master clock is also evident when you factor in that melatonin generated by the master clock is processed through the gut. Melatonin, a fat and water soluble antioxidant, passes through the gut during the fasting period in humans and may play a big role in repairing damage to cells in the gut. It also regulates swarming activity of at least 1 commensal bacteria(6). 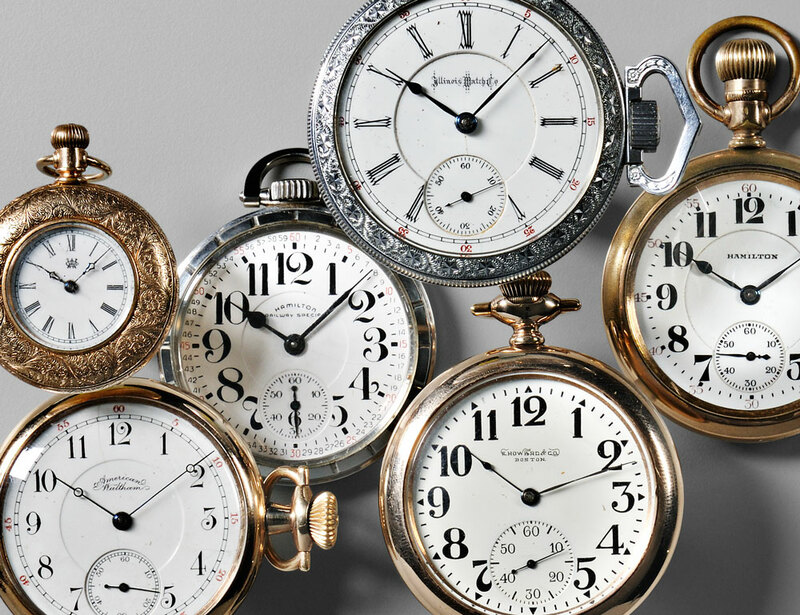 If these clocks are out of sync, this process is interrupted and gut health takes a hit. As you can tell from the above example, the gut is under heavy circadian influence. Disrupting these circadian rhythms leads to poor gut function and eventual gut pathology. Both inflammation and intestinal permeability, two factors associated with poor gut function, are regulated by the gut clock, and to some extent, the master clock. Intestinal permeability, inflammation, and detoxification are interlinked processes that are co-regulated together. Under proper syncing of your clocks, xenobiotic receptors are highly expressed in the gut and liver during the wake/active phase and less so during the sleep/rest phase. Xenobiotics contained in your food or produced by your microbiome, bind to these receptors and induce pathways that decrease intestinal permeability, inhibit inflammation, and promote detoxification. Disruption of this co-regulation of inflammation, intestinal permeability, and detoxification is seen in inflammatory bowel disease(IBD)(7). This, coupled with sleep disturbances also seen in IBD, indicates that circadian disruption may play a role in the disease. However, IBD is not the only gut disorder associated with circadian disruption. In a review of the science of circadian disruption and gut pathology, Vaughn et al. cover the circadian influence on gastroesophageal reflux disease(GERD), ulcers, irritable bowel syndrome(IBS), GI cancers, and IBD(8). Much of this review is based on prevalence in shift workers, but there are some mechanisms covered worth mentioning. In IBS, disruption of the circadian regulation of motility during the wake/active phase may play a role. IBS-D patients have shorter fasting motor cycles while IBS-C patients experience longer fasting motor cycles. To go along with this, a review looking at 4 studies found that the use of oral melatonin at night reduces the symptoms of IBS(9). Another study found that the levels of the primary urinary melatonin metabolite 6-sulphatoxymelatonin in relation to creatinine were almost 50% lower in people with IBS-D & IBS-C than healthy controls(10). SIBO is another gut disorder with a circadian component. However, there is actually clinical evidence, albeit in a very small study, that SIBO is directly related to circadian disruption. In a small within-subjects study with 11 participants, participants were randomly assigned to be exposed to either dim or bright light during the day and fed the exact same meals throughout the day. Breath hydrogen was measured as well as gastric activity. After a brief washout period, each participant was exposed to the opposite lighting condition. The study found that those exposed to dim light experienced greater breath hydrogen and decreased gastric activity after their evening meal than those exposed to bright light(11). The increase in breath hydrogen is indicative of carbohydrate malabsorption, the very symptom that the SCD and low FODMAP diets manage. This indicates that this malabsorption may be due to a misalignment of the circadian clocks due to inadequate daily light exposure. Ulcers provide a different perspective on circadian disruption in the gut. Under normal circumstances, non-stimulated gastric acid secretion follows a diurnal variation with highest production at night. Typically this peak is balanced by a circadian increase in mechanisms that protect the stomach, such as repair of the mucus lining(12), and followed by a period of low secretion. The pathogen Helicobacter pylori can disrupt this circadian rhythm and cause a chronic overproduction of gastric acid. As a result, there is no period of time where the gastric mucosa can repair itself. This is the mechanism by which H. pylori contributes to the formation of gastric ulcers. Gastrointestinal immunity is also regulated in a circadian manner, and pathogens can take advantage and in some instances hijack clock genes to promote infection(13). Pathogen exposure during times when gastrointestinal immunity is low increases the risk of infection. Once infection takes place, some pathogens such as H. pylori are able to disrupt circadian rhythms to promote infection. In a way, H. pylori needs to hijack the circadian clock in order to cause ulcers. Hijacking of clock function is a common attribute of many intracellular pathogens as well. Both the influenza and herpes viruses are able to replicate and infect host cells during parts of the day when viral immunity is at its lowest. And like H. pylori, they can hijack clock genes to promote viral replication(14). This is one of the reasons that herpes flare ups typically occur when you are “stressed”, although the actual stressor is likely circadian disruption. A final study worth mentioning looked at mice undergoing circadian disruption. In the study, the microbiome of mice eating a standard chow diet were not impacted by circadian disruption to a significant extent. However, when mice were fed a diet that closely approximates the standard American diet, there were robust changes in the microbiome after circadian disruption(15). 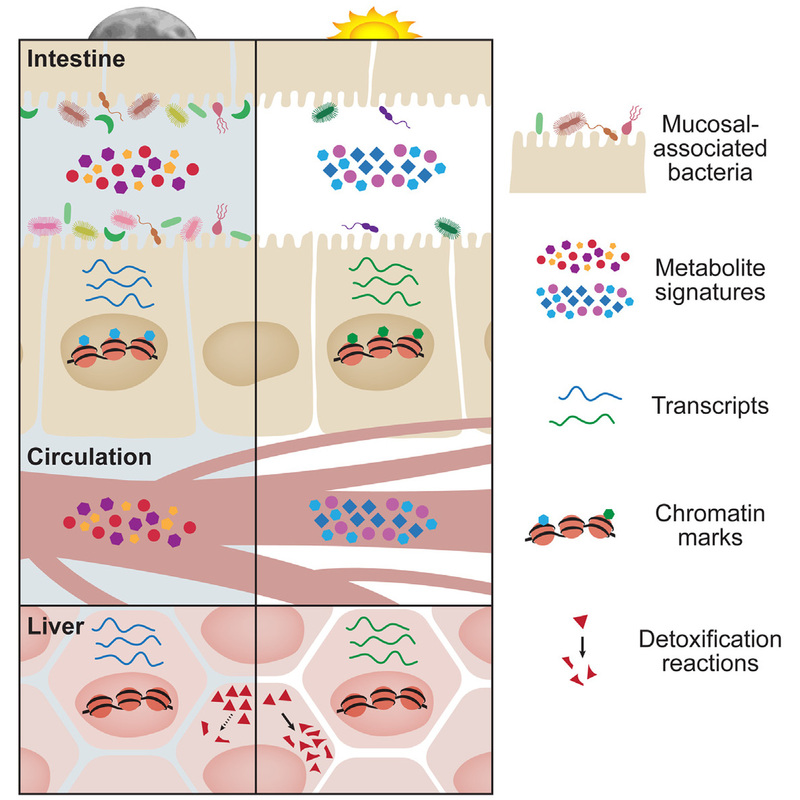 This study indicates an interaction between diet and circadian disruption may lead to microbial dysbiosis. Generally speaking, animal models of circadian rhythms show that poorly synced clocks are worse than losing the rhythms altogether(2). The primary reason being that the outputs of different clocks are often dependent on one another, and when the clocks aren’t communicating properly, physiology goes screwy. A great example of this can be seen with bile. Bile is made up of cholesterol, metabolized toxins, and bile acids in the liver. Some is stored in the gallbladder for secretion during meals, and the liver also directly secretes bile in to the duodenum. Suffice it to say, adequate bile output and timing is a pretty important factor for a healthy gut. Bile is a model for circadian disruption because its production crosses clocks. It’s also a great model because circadian misalignment disrupts bile acid homeostasis(16). There are many mechanisms that could drive circadian disruption of bile homeostasis. Cholesterol, from which bile is made, is regulated by the master clock. Bile is also created in the liver via an enzyme, CYP7A1, which is regulated by the circadian clock(17). Finally, there’s an intimate cross-talk between bile acid metabolism and cortisol. Cortisol and its rhythmic activity, both of which are regulated by the master clock communicating with the peripheral adrenal clock, are powerful synchronizers of the clocks(18). Cortisol also helps regulate bile acid output while bile acids regulate tissue sensitivity to cortisol. Approximtely 95% of the bile acids you produce every day are recycled back to the liver from the ileum and reused. Cortisol, through its binding to the glucocorticoid receptor, regulates bile acid homeostasis by regulating synthesis of bile acids from cholesterol(19) and transport back to the liver from the gut(20). Bile acids, on the other hand, help regulate tissue sensitivity to glucocorticoids through increasing receptor expression in target tissues(21). Misalignment between the master, liver, gut, and adrenal clocks can cause system-wide dysfunction that goes well beyond digestion and absorption. The effects can also be seen in blood glucose regulation and metabolism, lipid metabolism, detoxification, body temperature regulation, hormonal balance, and regulation of the sleep/wake cycle. Thus, dysregulation of bile homeostasis via circadian disruption is a great model for the health consequences of misaligned circadian clocks. There’s a dynamic interplay between every system in the human body. For the entire system to function properly, communication between inter-related subsystems is critically important. Much of the communication between the many subsystems of the human body are under circadian control. The master clock, controlled by light exposure, exerts some influence over the peripheral clocks. However, the peripheral clocks are also strongly influenced by other factors including the feeding/fasting cycle and physical activity. Under ideal circumstances, there is total alignment of the clocks. In order to accomplish this total alignment, there needs to be a harmony between the factors that regulate circadian clocks in different tissues. In all organisms, light exposure, the feeding/fasting cycle, and physical activity all exert control over the circadian clock system. The gut is under heavy circadian influence. Circadian disruption has a dramatic effect on the health and function of the gut through many factors including bile acid homeostasis, a model for circadian disruption. This fact underscores the importance of scheduling the day in a way to take advantage of the clock-syncing effects of zeitgeber exposure. Interested in syncing your clocks? I’ve developed a program to help take the legwork out of figuring out how to schedule your day. My new Circadian Retraining Program helps you set your light exposure, feeding/fasting cycle, and physical activity so that you can take advantage of properly synced clocks. There’s also some added features that help you navigate factors such as exercise and coffee intake that have an effect on the clocks. The program includes unlimited access to the facebook group where I can help you personalize your zeitgeber exposure schedule. Send me an email from the contact page here if you’re interested.